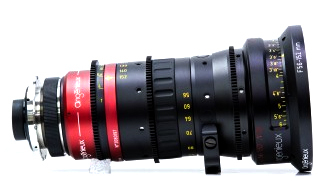 The Angenieux 56-152mm T4 A2S zoom is the first anamorphic zoom manufactured by Angenieux. With this lens of only 2.2 kg, in 2013 a new line of compact and light anamorphic zooms was born. It has a focal range of 2.7x with a T4 aperture throughout its path.